On Friday afternoon, they were complete strangers. By Sunday afternoon, they had created 30 new solutions to real-world problems related to health communication, from apps and websites to devices and electronic medical record innovations. Four of those ideas emerged as winners, but all hold the potential to keep moving forward toward real-world application. The frenzy of innovative activity happened as part of the first-ever Gupta Family Hackathon for Health Communication. Organized by the U-M Institute for Healthcare Policy & Innovation (IHPI) with support from alumni Sanjay Gupta (M.D. 1993, Residency 2000) and his wife Rebecca, who received two bachelor's degrees from U-M, the event brought together more than 120 students and professionals from U-M and other higher-education institutions, as well as community members. Teams worked late into the night, and started early the next morning, to complete their project concepts, designs, prototypes, and business plans. 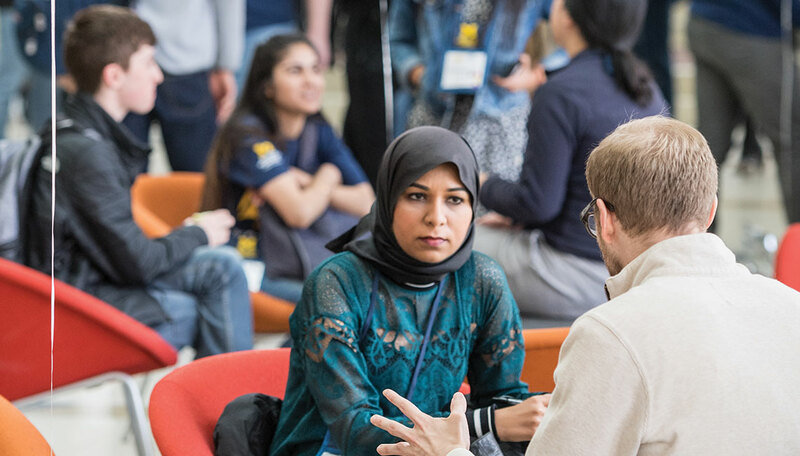 Two dozen U-M faculty members and business leaders offered their time over the weekend as expert mentors, as the atrium of the Taubman Biomedical Science Research Building was transformed into a hub of innovation. Detroit Health Department director and U-M alumna Joneigh Khaldun, M.D., M.P.H. ; Jeff Arnold, founder of WebMD and Sharecare; and Sanjay Gupta provided context and inspiration in keynote talks. In just over 24 hours of work, teams drawn from the worlds of clinical care, health sciences, science, engineering, digital technology, communication, business, and design teamed up to create new ways to overcome gaps in getting the right information to the right people — at the right time and place. The event opened with brief “pitches” by those who knew of health communication problems in need of a solution. These ideas became the nuclei for teams that self-organized Saturday morning, each with members from different fields. The teams then scattered throughout the atrium to work intensely for the next 24 hours, with some taking a break to watch U-M play in the NCAA basketball tournament or to catch a few hours of sleep at home. By Sunday midday, they were ready to give brief presentations, showcasing the product of their weekend of hacking, in front of their fellow participants and a panel of judges. Focused on creating a “knowledge graph” of interests and findings in health care and biomedical research that is based on phrases rather than keywords, and offering a free platform. Sample API available here. Team members: Haitham Maya, Ashish Kamath, Max Hamilton, Alvin Tong, Sujai Arakali, David Chang, Kayura Mendonza, Matt Gaidica, Maninder Singh, Akira Nishii. Focused on creating virtual-reality representations of health care facilities and procedures, with interactive narration, to help patients understand their care environment and experience in advance, and to reduce anxiety. Sample available here. Team members: Sameehita Mohan, Haoran Xiao, Victor Manske. Based on a team member’s own experience as a mother of an infant treated in a neonatal intensive care unit, the group’s digital dashboard focuses on integrating and presenting data about a critically ill newborn’s progress and care in a way that overwhelmed parents can easily understand. Team members: Elizabeth Wason, Andy Scott, Alicia Secord, Divya Patil. A platform to enable real-time communication between providers and patients and among health care providers, while also feeding documentation into the electronic medical record.